Many kinds of orchids can successfully be grown with artificial light. Artificial lighting might even work better for you than a windowsill because it allows you to have total control over the amount and light intensity that your orchids receive every day. Rooms that you might have never thought could be utilized to grow plants in such as attics, walk-in closets, and even cellars can become an orchid growing sanctuary. However, you will want to make sure that you fully consider your budget before undertaking an artificial lighting project, because the equipment and electricity bills can be quite pricey. When growing orchids under lights, the best kinds of orchids are low or medium-light orchids. Orchids that require high-light intensity don’t do that well because it is hard to replicate the light intensity required by these orchids with artificial lighting. The three most common types of artificial lighting used in growing orchids are fluorescent, high-intensity discharge, and LED. Incandescent light bulbs, which are basic household bulbs, are not recommended because they give off a lot of heat and are not energy efficient. The first type of recommended bulb is fluorescent tubes. Not only are these very easy to find, they are also energy efficient. If you have orchids with low-light intensity requirements, you will need to get four 60-watt fluorescent light tubes and place them approximately four inches from the top of the orchids. You should position the orchids towards the middle of the tubes since this is where the tubes give off the most light. If you only have a few orchids, a compact fluorescent bulb is a good option and can easily fit in any standard lamp. Once a spike emerges from the orchids it is important that the spike doesn’t touch the light because this can cause damage. You might want to move the orchid to a windowsill to prevent this from happening. The second type of recommended bulb is high-intensity discharge (HID) lights. 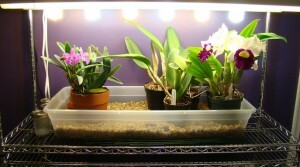 HID lights tend to be more expensive but are great for orchids that require a brighter light intensity. HID lamps come in two types: metal halide and high-pressure sodium. Metal halide lamps produce a natural-looking blue light which encourages leaf growth and high-pressure sodium lamps produce a yellow-orange light that encourages plants to grow taller. HID lights come in several different wattages. The higher the wattage, the further away from your orchid it should be placed. For example, 250W HID light should be 1-3 feet above your orchids, 400W HID light should be 3-5 feet above your orchids, and 1,000W should be 5-7 feet above your orchids to prevent them from getting too hot. The third type of recommended bulb is LED lights. These are the most energy-efficient option; however, they are fairly expensive in comparison to the other types. These are great for orchids that are cool-growing since the LED lights emit less heat than the other types of artificial lighting. Some LED lights are specifically made for growing plants and include a broad light spectrum. In order to provide the adequate amount of light intensity (measured in foot-candles) your orchids require you will need to determine how many foot-candles each light emits and buy as many as needed. Low-light orchids need to receive 1,000-1,500 fc; medium-light orchids need 1,500-3000 fc, and high-light orchids need 3,000-4,500 fc. You will also want to make sure that artificial lighting that you choose offers a balance of red and blue lights. This is important because the red (warm) lights help to produce flowers and the blue (cool) lights help to grow leaves. You can buy lights that are made to provide the full spectrum, or you can use a mixture of cool white and warm white tubes. Many people who grow orchids under artificial lights opt to buy a timer to ensure that their orchids are receiving the correct amount of light each day. Many growers like to set their timers to turn the lights on when the sun rises and turn them off at sunset. Generally, you will want to provide 14-16 hours of light during the summer months and 12-14 hours of light during the winter months, however, that is entirely up to you. Providing your orchids more than 16 hours of light per day will not only be expensive for you, it is not recommended for your orchid and does not do them any good to receive the extra light. It is important to remember to water your orchids more frequently because the artificial lights tend to dry the orchids out more quickly. In order to be successful with artificial light for orchids, you will also have to maintain proper temperature, humidity, ventilation, and fertilizing requirements.